"It would feel like murder to pull her life support," a young woman tells the doctor. The woman sits by a hospital bed where her mother, Selena, lies unresponsive, hooked up to a breathing tube. The daughter has already made one attempt to save her mother's life; she pulled Selena out of the car and performed CPR when her heart stopped en route to the hospital — an experience she calls "beyond terrifying." Now the doctor tells the family Selena will never wake up in a meaningful way. But the daughter says she can't let her mother go: "I'm always looking for another miracle." The scene, captured in the documentary "Extremis," took place in a hospital intensive care unit in Oakland, Calif.
Three thousand miles away, at Boston's Bethel AME Church one recent fall evening, the Rev. Gloria White-Hammond watched the film with a group of women from her predominantly black congregation. As they gathered around a long table in the church's youth center at 7 p.m., White-Hammond offered oranges and chocolate chip cookies — and a warning that the film may be very hard to watch. 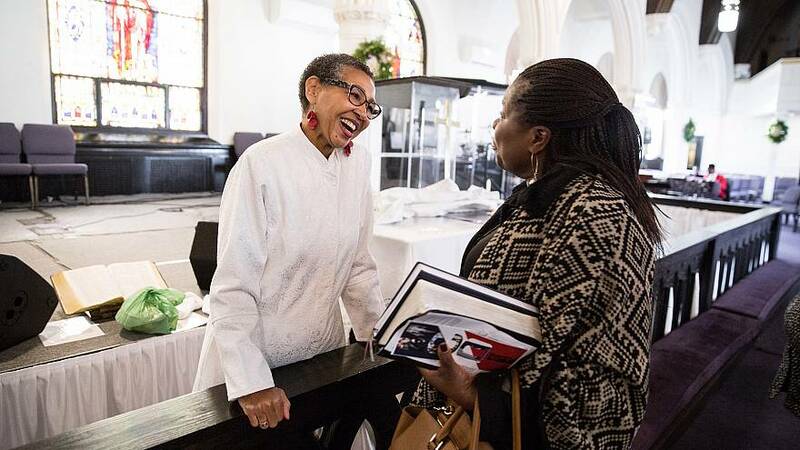 White-Hammond, an energetic 67-year-old activist and minister who also teaches at Harvard Divinity School, is accustomed to broaching difficult subjects. She often speaks out about being sexually abused by her father during childhood — an experience that motivated her to work with survivors of sexual violence in Sudan. Now she's using her unusual credentials as a pastor — and a pediatrician — to take on a new subject: death. As the film ended, White-Hammond and her congregants sat quietly as letters on the screen revealed Selena's fate: The family had Selena surgically attached to a breathing machine. She lived that way, drifting in and out of consciousness, for nearly six months. "We know Selena," she said, speaking metaphorically. "Her brothers are our brothers." "God, guide us and direct us," said White-Hammond as heads bowed. After they die, she said, her parishioners may see the face of Jesus, and "sit at his feet and be blessed." White-Hammond treated patients until about seven years ago, and her husband and co-pastor, Ray Hammond, is a doctor, too. But when an organization called The Conversation Project approached her a few years ago about leading death-and-dying workshops with her congregation, she discovered she hadn't planned for her own death or serious illness. "I didn't have my own documents" outlining medical wishes, she said. "I was kind of embarrassed." Another KFF poll found that blacks are more likely than whites to say that living as long as possible is "extremely important," and that the U.S. medical system places too little emphasis on extending life. As part of the discussion at Bethel AME, White-Hammond asked attendees to look through the "Five Wishes" end-of-life planning document. At monthly workshops, White-Hammond has introduced over 100 parishioners to the document over the past two years. She said people often get stuck when filling out the second wish, which asks whether they want life support in certain grim scenarios that they may not be familiar with, such as permanent brain damage. White-Hammond screened "Extremis" to illustrate what ventilators and feeding tubes are really like — and what it's like for families to make decisions without explicit instructions. The documentary, which lasts an intense 24 minutes, provoked a strong response. "Nobody should be hooked up to this and that, like Frankenstein." Janine Hackshaw, a 35-year-old black immigrant from Trinidad who works in microfinance, told the group she felt anger toward one ICU doctor in the film. She felt the doctor was rushing a family to make a life-or-death decision about whether to put their loved one on a ventilator. "Why is she rushing?" Hackshaw asked. "Do you need the machine for something else?" The mistrust persists today as "race becomes more tense" across the country, and as people continue to experience disparities, White-Hammond said. Like some other black church leaders across the country who are trying to change perceptions around hospice, White-Hammond believes cultural change can start at church. "We're capitalizing on our credibility as an institution of faith" to drive conversations around end-of-life care, she said. The goal, she said, is to make these discussions "part of the culture." Another obstacle, White-Hammond said, is that people don't want to talk about death. "I never wanted to deal with it," she said. But she said she learned a lot from her mother's death, including the pressure families could create to keep a person alive. Julien, a 58-year-old environmental scientist, was the sole caretaker for her mother, who had pulmonary fibrosis. At the very end, Julien said, her siblings wanted to put their mother on a ventilator, to keep her alive long enough so that they could fly from Trinidad to say goodbye. Julien refused. "She's not going to be connected to a machine to keep her alive for other people's benefit," Julien recalled thinking. "Nobody should be hooked up to this and that, like Frankenstein," she said. She described her grandmother, who moved to the U.S. from Haiti, as an independent, strong-minded woman who would regularly walk an hour to church instead of taking a bus. She raised three kids on her own and made a life in the U.S., even though she didn't speak English, couldn't read and had no formal education. The young woman said she feels frustrated that her family didn't prioritize what her grandmother would want. "We were hoping for a miracle," she said. But she knew her grandmother "wouldn't have decided to live a life where she would be bound to a bed." Dr. Alice Coombs, one of three black female doctors participating in the evening's discussion, turned to the young woman and gently suggested that she speak up on her grandmother's behalf. "I took it as a challenge," the young woman later said, "to talk about this topic." Julien said she was initially reluctant to talk to her own kids about her end-of-life wishes — "Are you jinxing yourself?" she wondered — but she successfully broached the subject as part of homework for the workshop. After watching the film "Extremis," she said, she felt motivated to take the next step: "I'm going to fill out these forms!" As the discussion ended, White-Hammond prayed to God for help filling out those end-of-life forms. "Put the fire under us," she asked, so the task doesn't languish "on the to-do list."